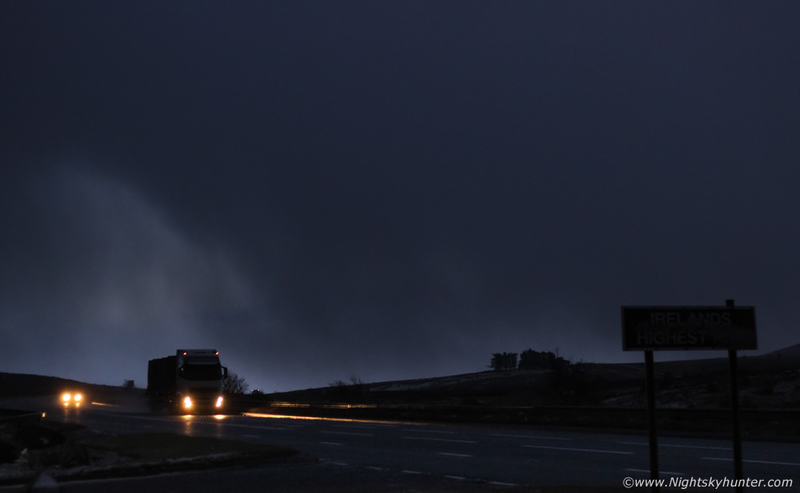 It's currently mid December as I write this and already we have experienced two cold spell events which have produced photogenic wonders for the run up to Christmas, both of which have kept me very busy with day and night chasing. The first cold spell began on November 23rd and lasted for over a week with deep polar air descending all across UK and Ireland producing freezing nights, cold days, wonderful clean blue skies and the first snowfall of the season. I drove to the top of Glenshane Pass to experience my first snow flakes during last light and got rewarded with sleet then wet snow on the 23rd, I was delighted to experience my first snow so early in the season and even though it wasn't laying at this stage it still felt invigorating and exciting. Miles away to the W and NW large cold air towering cumulus where dominating the skyline which quickly evolved into a cluster of cumulonimbus cells, I could see their anvils and updraughts catching the warm light of the setting sun, they were so good I grabbed a few images with the 100-400mm lens for the record, however I will not share them here as I wasn't happy with the focus. It wasn't until I returned back home that I learned that a photographer had captured a very clear waterspout (tornado over water) over Donegal complete with spray bowl on the sea, it looked a spectacular event and even more so with a curtain of hail or sleet beside the spout, it's not often one gets lucky enough to catch a tornado in a cold air Nly flow at this time of year, they do happen, but most people miss them because of the cold weather, or darkness or because of wintry precipitation hiding the vortex, so I commend the photographer for catching this spectacular event. Once I checked the compass point, time, and radar I realized that my image of the distant cell was the very one that produced that waterspout, not bad at all for a one hour drive out in the cold. Thundersnow to the W and NW occurred sporadically during the night with scattered inland snow showers on the hills. I wasn't expecting anything worthy of getting up early for as none of the local forecasts, including television forecasts, mentioned anything about laying snow. It was considered that infrequent shower activity and borderline cold temps at the surface would melt any snow so I never expected anything of note. 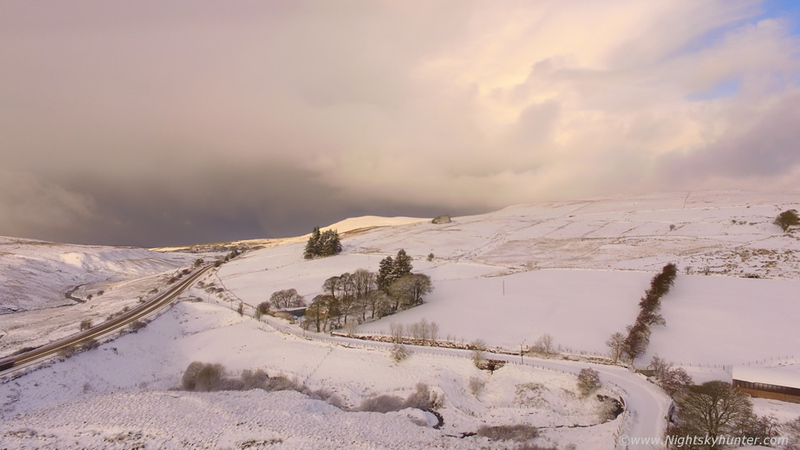 The next morning I was suddenly woke by my phone ringing, it was photographer and drone pilot Nigel McFarland from aerialvisionni, Nigel informed me that from his location at Limavady he could see the Glenshane covered in snow. I couldn't believe what I had heard, I immediately changed, had a brew, then drove up the mountain during the morning and experienced my first snowfall of the season, I was shocked to see the entire mountain covered in a carpet of white, this was beyond my expectations. I spent the entire day in the snow, I got five drove flights in between morning and afternoon and documented the day with DSLR stills and by the time sunset came I was exhausted but buzzing. When I checked online I was shocked and amazed to see that two more waterspouts had been captured, this time off the Antrim coast near Rathlin Island. The photographer captured two very well defined funnels with twin spray bowls over the sea at the same time sharing the same camera field, this was amazing, and the same spouts where also captured from the Giant's Causeway. Later that night photographer John Fagan and I were examined the images and came to the conclusion that there were actually three waterspouts in the image with two of the spray bowls seemingly merged into one via line of sight, this was incredible, that makes a total of four waterspouts along the Ireland/N. Ireland coastline within 24 hours, in my opinion this first cold spell was already in the epic category for this reason alone. Polar air remained in place and more frequent snow showers fell over night and on the 25th I was ready for them. This time I was up at 07.00 and made my way back to Glenshane for dawn. I was greeted by a nice layer of fresh snow several cm thick, and as the sun rose in the east it lit up an advancing snow shower approaching me from the NW, the clouds were vivid pink then orange over the white snow, it was worth being up early just to experience that. I spent much of the day in the snow again, filming traffic in heavy snow showers, driving around looking for photo potential, I hooked up with my Dad in the afternoon and we got three more drone flights completed over snow. The cold air stayed with us for ten days making this quite a potent event, we had three days of hill snow then high pressure built later in the period leaving plenty of crisp cold days and nights. I took many images throughout this time and can't post them all on here, however I have included the above two for sentimental reasons. 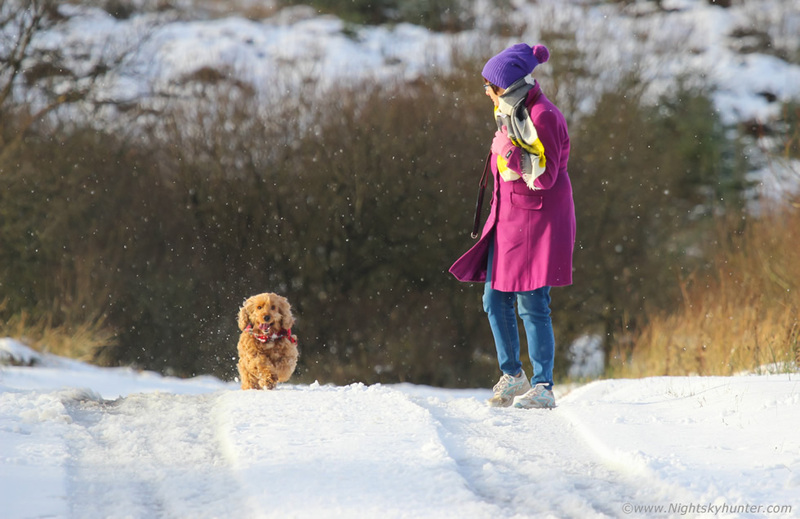 The first was on Glenshane Nov 25th, I took my Mum and our Dog Rhua up to experience the snow, this was a fun time free of the pressures of photography and filming, I intended on taking no images, I simply wanted to experience the joy of the snow and have fun. Rhua only seen proper snow once six years ago and has never seen it since, at least none of any substance. This day we brought her up and when we stopped at the top she was sitting in the seat with her head turning non stop and whining, she couldn't believe that her familiar world was now a white vista, she was like a child and couldn't wait to get out of the van. We had a delightful walk through 4" of beautiful white snow lit brightly by the low afternoon sun, the landscape was utterly beautiful and beyond words with blue sky and clean powdery snow, the kind that makes you feel like a child. Rhua was running around going mad barking and hopping through the snow like a rabbit, she was loving every minute of it, I got this image with the telephoto lens, Mum and Rhua together in the snow, a great memory to look back on. 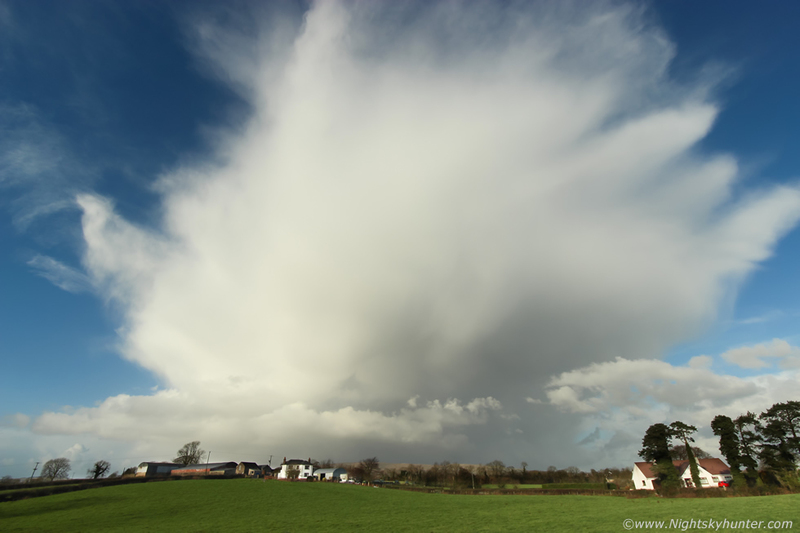 Two days laters later Roisin and I where driving along the carriageway outside Cookstown, we spotted this beautiful cell building over the Sperrins then creeping over Slieve Gallion heading for us dropping a heavy curtain of sleet and hail stones. I wanted to get a shot as the light was great so we pulled over and I ran out to get this image, the cell was bright white in the sunshine and surrounded by clean polar blue skies, I could barely fit it into the 10mm frame, this was a superb example of cold air convection, a classic winter cb, these are the cells which not only produce hail and snow, but also lightning/thundersnow and tornadoes if atmospheric conditions are favourable. I put my camera back in the bag, turned around to put the bag in the boot, then suddenly I heard a loud sickening crack! !, I looked down, my camera had fallen out and landed hard on the tarmac, my camera bag had not been zipped shut, a rookie mistake, I feared the worst, my DSLR was probably ruined and the glass on my 10mm no doubt cracked. Amazingly other than a broken lens hood everything seemed fine and the camera worked, I thanked my lucky stars, that was a close one. However it wasn't until a couple of nights later that I went on a night shoot to the coast and returned to build my star trails when I noticed to my horror that all the images were extremely soft on the left side, in fact, all my images were ruined. I shook my lens and I could hear glass disloged, it was obvious the elements were moving inside their housing, the lens was done for, this was my favourite wide angle lens of all time and now it was ruined, I was gutted. I decided then and there that I would replace it for Christmas however in the meantime I would have to revert back to using the older Canon 10-22mm F/3.2 lens. The second cold spell arrived on December 7th and this one looked even more potent with models showing freezing Arctic air and all parameters looking great for snow, in fact, the latest GFS run showed snow showers every single day for almost a week with deep convection associated with the air mass meaning more heavy showers and lightning potential along inland coastal areas. Nigel and I where back up Glenshane at sunset on the 7th to catch the first of the winter action when showers moved in from the N turning from hail to sleet then to wet snow. During last light the dark curtains of hail and snow made for a dramatic sight as they swept across the pass and over the rush hour traffic, it was bitterly cold outside and the wind chill was nasty, it would get worse later, all forecasts were going for heavy snow showers in this area throughout the night. I was planning a very early morning on this mountain so we agreed to meet again at 07.30 on the 8th for what could be a busy day of action. Next morning my alarm went off at 06.00 and I was up like a rocket, I put on a thermal jump suit with thermal trousers over these, then several layers of clothes and a thermal top then coat, arctic buff and cap. I prepared a quick breakfast and packed a flask, turned on my engine early and let it run to clear the ice off the windscreen and brushed the snow off all my lights and roof. My drone was fully charged from the night before, I set it on the passenger seat with the lid of the case open and sea belt around the lid for safety. Once the windows were cleared I turned the heater vents towards the drone, this way I could keep the aircraft and batteries warm, I had also undertaken a very cold IMU calibration which would help reduce or eliminate aircraft warm up times. I had to keep the batteries warm for if I didn't they can reach a critical low temp and voltage in very cold weather, when this happens the drone will automatically land itself no matter where it's at, which happened to me before, so I do as much preparation as possible to increase the chances of my drone operating efficiently and safely before flying. I put on my head torch and got my 100-400mm lens positioned near the drone within easy reach, Go Pro on, and I was ready to go. I drove off into the darkness into the unknown. 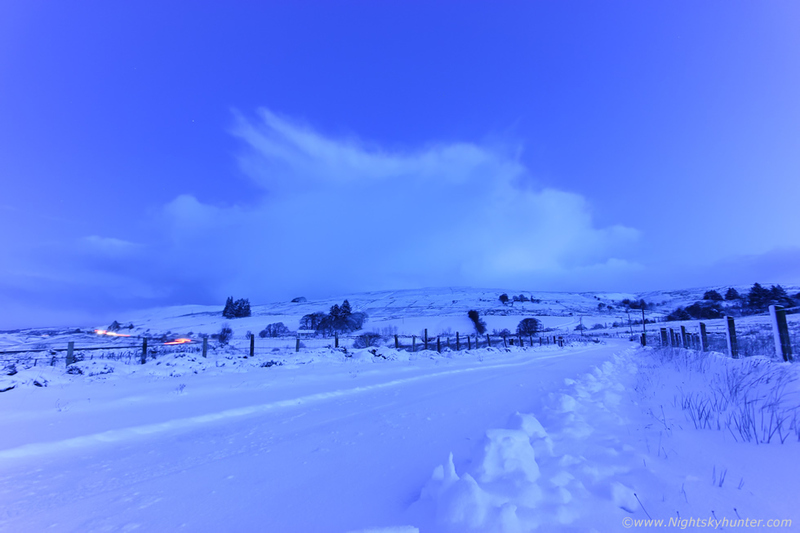 I arrived on Glenshane Pass by 06.30 and it was still night time, I found a lay by and parked there to take in the situation, there was a nice layer of snow on the mountain and more snow showers were expected so this looked like it was going to be an interesting day. Heavy snow began to fall so I switched on my headlights to view them as Bing Crosby sang White Christmas on the radio, it was very fitting and I was in my element enjoying every second of it. Soon the wind picked up in a vicious snow squall and as I watched snow was lifted from the road and blown across the pre-dawn traffic, I attached the 50mm F/1.8 lens and acquired hand held footage with the DSLR through the windscreen, then ran outside into the blowing snow to film once again. 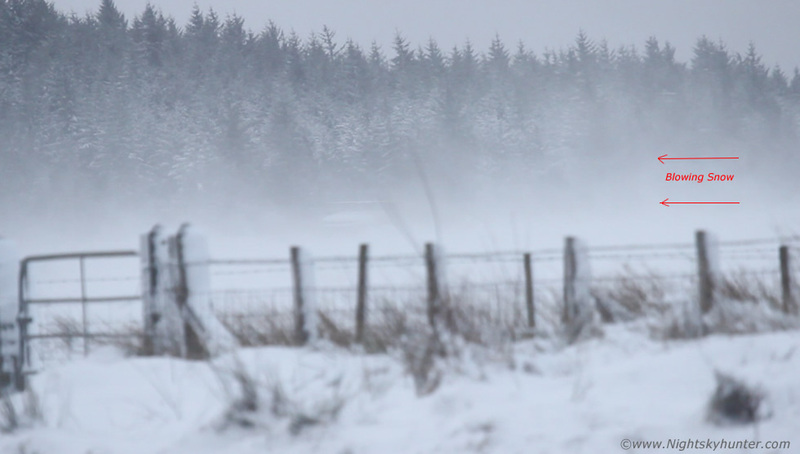 This is a still from the footage, the white 'mist' is snow blowing through the air from left to right, it was a dramatic sight as the first cars and trucks of the day battled with the elements. After half an hour of heavy snow the flakes began to fall more softly and gradually the clouds parted to reveal a clear pre-dawn sky. I was delighted I had been out early to experience this magical moment, the sublime transition from twilight to dawn. 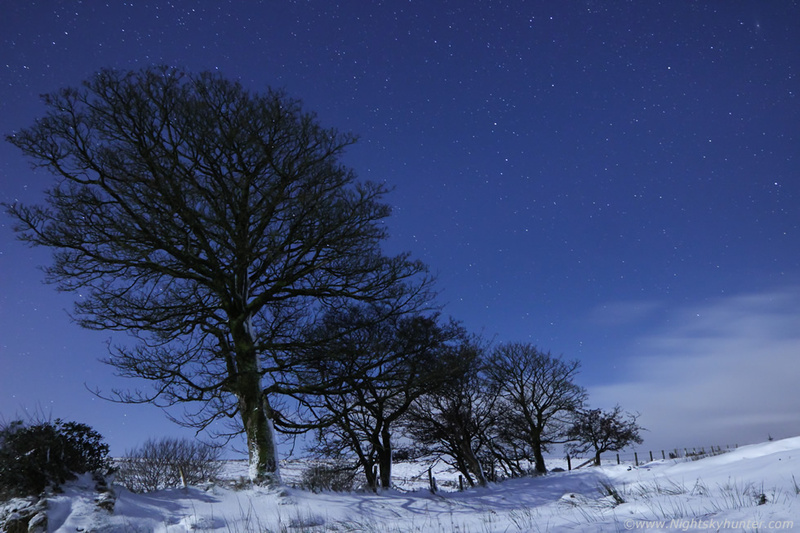 The sky was polar blue and clean, I got out from the van and got my DSLR set up on the tripod with freezing fingers and began taking short exposures to capture the winter landscape and sky during this magical light. This was the back road I had drove up, above two big snow showers can be seen behind the mountains due north heading in my direction. Several inches of new snow crunched beneath my boots and my breath condensed into an icy cloud in the sub freezing temperature, my van was reading -3C. One of the shower clouds was almost on me and was filling much of the frame of the Canon 10-22mm, I was stopped down one click, ISO100, 5 seconds, several stars were still visible around the clouds and the waning moon was high in the sky behind me, what a gorgeous sight to wake up to! I got inside the van, warmed my freezing fingers up in the heat and made myself a hot brew which gave me a renewed glow. More snow showers arrived so I waited for dawn, it arrived unseen, however I knew it was there because the sky had that festive looking dark blue colour behind the falling snow flakes like a scene from a Christmas card. Nigel had been shooting snow scenes on the Coleraine mountain then made his way in my direction then by 07.30 he had arrived. We got the drones up early and documented the first flight of day which looked dramatic with the car headlights moving through the morning snowscape, however it was still a little too dark and the light wasnt good so we landed and warmed the next battery up beside the heater. A little later the sun rose and the snowy landscape was cast in gorgeous warm light, we raced to get the drones in the air once more, we didn't want to miss this great light, Nigel flew E and I flew W.
This was the view, sun at sunrise with dramatic dark skies moving in, that massive cell was pregnant with more snow and closing in and the closer it advanced the stronger the wind would become, I was taking video then stopping for aerial stills, I climbed to 80m altitude and suddenly the gimbal began vividly shaking from side to side in an alarming fashion, I rapidly dropped in height to 50m and the shaking stopped. I suspect strong winds were to blame, it was just a breeze here and we were sheltered from the N wind by the mountain however once the drone climbed in height it got exposed to those +20mph winds over the summit, however what a view. Facing E at the clouds lit by the sun rise, suddenly a stunning sundog appeared 22 degrees to the east of the rising sun, it was located above a snow covered landscape and looked like something from the Arctic, this sundog was large with vivid red, blue and white colours forming on falling ice crystals or diamond dust, I flew the drone towards it however the camera had trouble exposing for it with the sun in the same frame, the visual sight was stunning and added to the beauty of this stunning Winter morning, we landed the drones just as the wind picked up and the next snow storm arrived. Morning rush hour turned nasty, very heavy snow showers arrived one after the other greeting drivers on their way to work, the roads were turned white again and visibility dropped, this is a video frame of snow blowing in blizzard-like fashion, the snow was picked up and blown across the fields then across the road into oncoming traffic, in this image the snow is blowing from R to L, taken through the long lens at 400mm and focused on the trees hence why the foreground is out of focus. 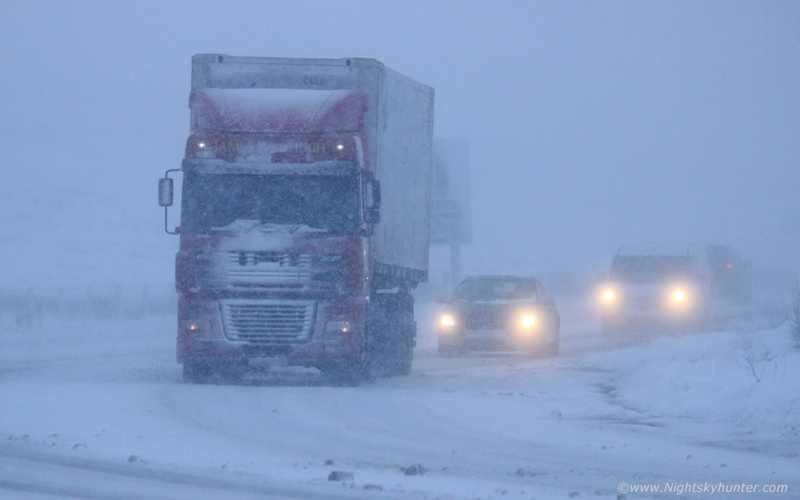 The morning was spent shooting stills and video footage, at times day was turned to dusk by the heavy snow as traffic slowed down to accommodate the drop in visibility and increasingly slippery roads. Despite regular gritters and tractor plows going back and fourth all morning the roads were soon covered again then gritters were out once more. By midday I headed home, got lunch and met up with my Dad ready for a return trip to Glenshane, Dad has been on these snow covered roads since he was young and has it in his blood, that must be where I get my love of snow from. We had a scenic mid afternoon drive along the more dangerous back roads and the scenes were epic, the landscape looked like a Christmas card scene everywhere we looked, some of the hills and trees were gorgeous and perfect, there was 4" of snow resting on every tree branch and the pine trees looked like Christmas trees, some of the bushes had clusters of red berries with the snow which was nice to see. The light wasn't great however visually it was an absolute treat, we could have drove around here all day, it was winter heaven, the snow was deep and widespread here too and in my mind it planted a seed in my mind, if this snow lasted could there be potential for epic moonlit snow scenes tonight?, I would go home first, warm up, study the charts and make my decision later, but for the moment I was savoring this great day out, yet another fine winter memory in the making. Back home I was exhausted from all the excitement and hours spent out in the snow so I lay down in my room for a while basking in the heat, I could easily have fallen asleep and was very tempted to do so, I might just forget about tonight's potential shoot. An hour later all that changed, I forced myself up and thought about the set up, what was I thinking, I should be out tonight no matter what, moonlit snow scenes are among my favourite winter imagery and I look forward to it every year, also getting the timing is rare, you need a decent amount of snow to coincide with a bright moon phase and clear skies, all three of these ingredients are needed, believe it or not it doesn't happen often, you either get a good snow fall during the new moon phase, or else you get a bright moon but not enough snow to work with, or you get both but its cloudy and without stars the images simply wont have the same impact. Tonight the moon would rise at 22.00 and waning, just a day or so from last quarter, this was just enough to get away with, furthermore the Met Office were giving 'widespread clear skies' and temps between -5C and -6C with further scattered snow showers throughout the night, all the boxes were ticked, tonight was going to be the night, if I could make this work and get a dew good moonlit snow images I would be thrilled and satisfied, this would be the icing on the cake of this cold spell. 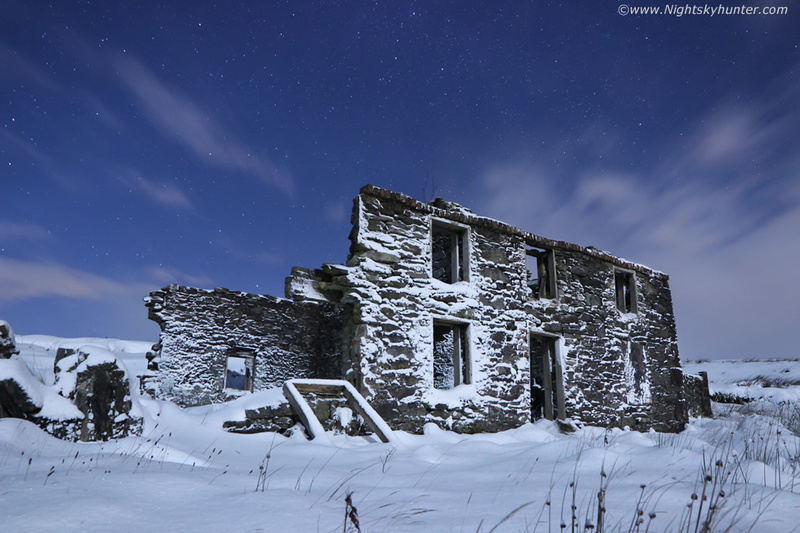 I got chatting with photographer Paul Martin who was working in Ballymena and mentioned the moonlit snow idea and much to my delight he was game for it too, now this was turning into a very interesting night, Paul and I have had our best moonlit snow adventures together in the past, both shoots were truly epic and one of them was at the same location I had in mind tonight. Paul left work late, drove to Omagh, got stocked up with supplies then drove to Maghera where I met him at 22.30, the moon was visible but low in the sky, when it rose higher we would be in business. I moved the camera gear into Paul's jeep then headed up Glenshane Pass into the unknown. 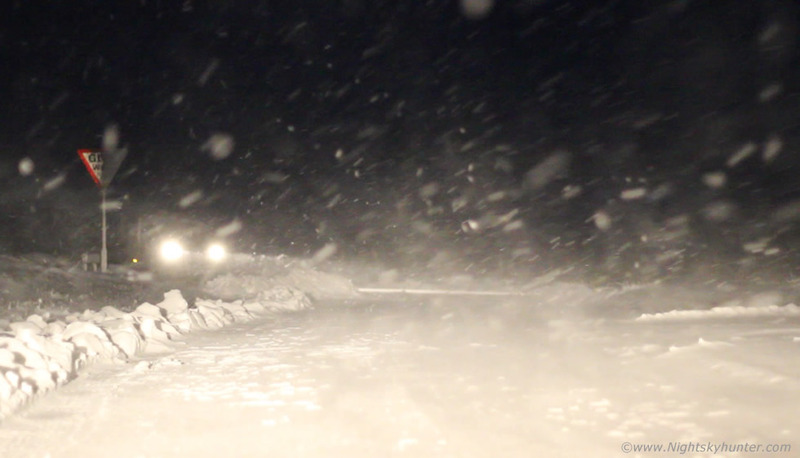 We drove through a new snow storm, snow flakes raced towards the windscreen at high speed and got so dense we could barely see our turn off but with a little careful positioning we found it and pulled in. Initially we had stars on arrival, and we got out for a look, we were shocked how deep the snow was, I mean amazingly deep, we knew then that we were in for a good night. 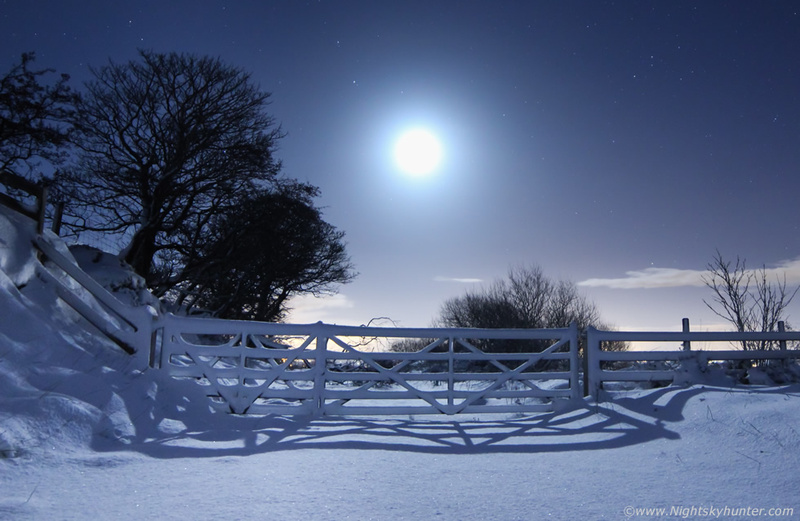 Paul really liked this gate scene so we decided we would not advance any further until the light was perfect, we wanted no footprints in the snow and the moon needed to be bright. The clouds arrived again with more snow so we got back in the jeep. Radar showed a line of big snow showers piling in towards us from the N and satellite images were very concerning. There were small gaps between the showers but much of the country had shower clouds and high level cloud ahead of the next front was already on the W coast and advancing, we were worried because we needed stars for the images to work. We waited for what seemed like hours, had warm brews and snacks and chatted about photography. I mention about my Samyang 10mm F/2.8 lens breaking on me, which meant I was stuck with kit lens, 50mm F/1.8, Canon 24-70mm F/2.8 or old (and soft) Canon 10-22mm F/3.2. Paul came up with a great idea, he had a Samyang 14mm F/2.8 lens which he used with his full frame 6D which might just work, it was worth a try he suggested, so I attached the lens and took a few hand held exposures and amazingly I saw no corner shadows or other issues, it seemed to work, suddenly the cloud broke and a bright moon and stars appeared, it was 03.00 in the morning and freezing, but the world looked truly epic, our moment had arrived, we were out and began shooting. We spent some time with gate to get the composition correct with the moon above the snow covered fence surrounded by the stars of Leo and Hydra. We walked into winter wonderland, Paul and I were shocked by how incredible the location looked, it was far beyond our expectations, we were walking through powdery untouched snow which was up to knee height and which covered the entire landscape and mountain as far as the eye could see. 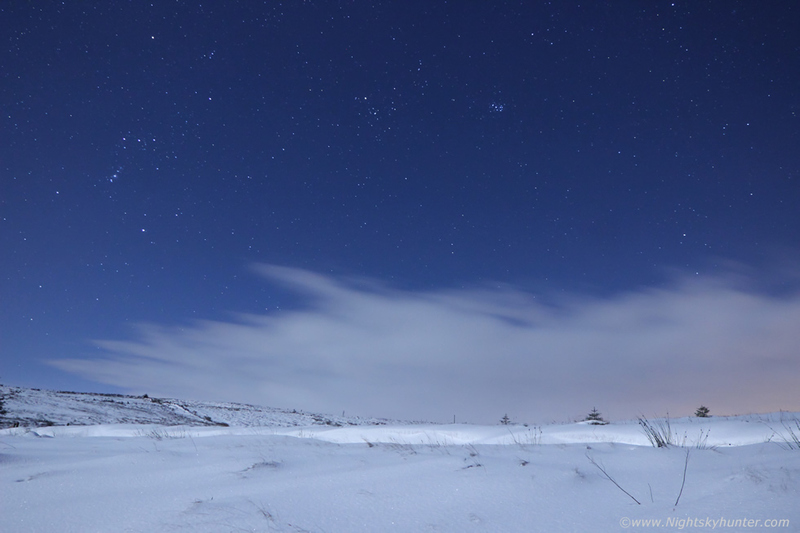 We immediately began taking images, I decided to shoot Orion, Taurus and the Pleiades over this large moonlit snow drift, at a glance you would think this was from Iceland, not Glenshane. This perfect tree alignment had to be captured in the snow. 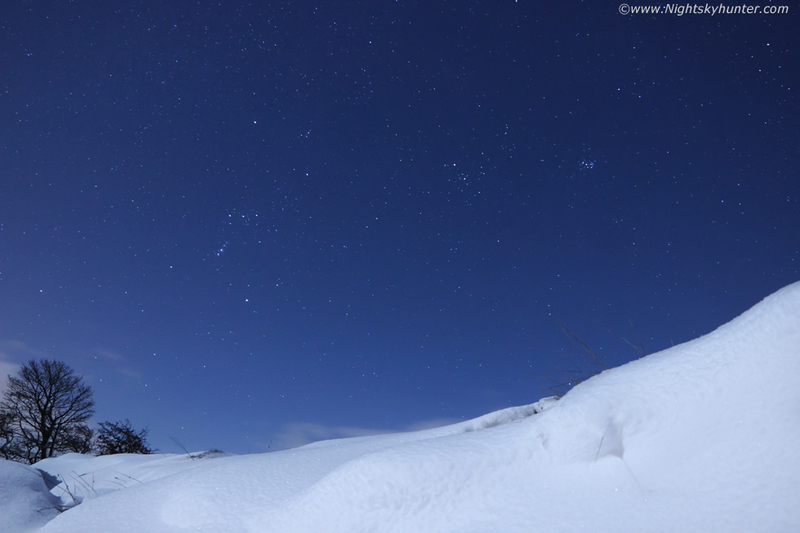 We couldn't believe our luck, the snow was gorgeous and the skies perfectly clean and filled with bright winter stars. I was equally blown away by Paul's Samyang 14mm lens, I had stopped it down from F/2.8 to F/4 and the resulting images were tack sharp from corner to corner with barely any coma at all, the lens was astounding and thanks to the moon phase I was able to get the snow lit up brightly with plenty of stars in my exposures, I was shooting ISO1600 for 20 to 23 seconds on tungsten white balance. 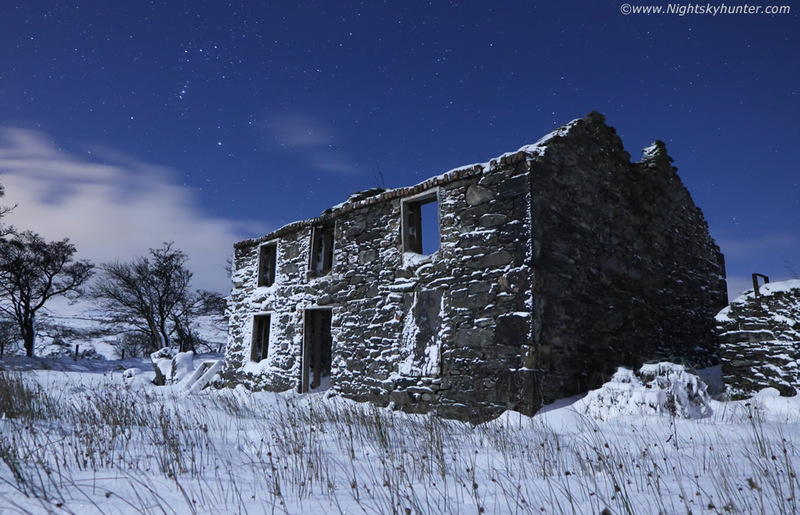 The derelict house was the star of the show, the last moonlit snow shoot we did here was the most memorable of our lives, and yet again it was doing us proud, conditions were very similar to that last shoot, in other words they were stunning. 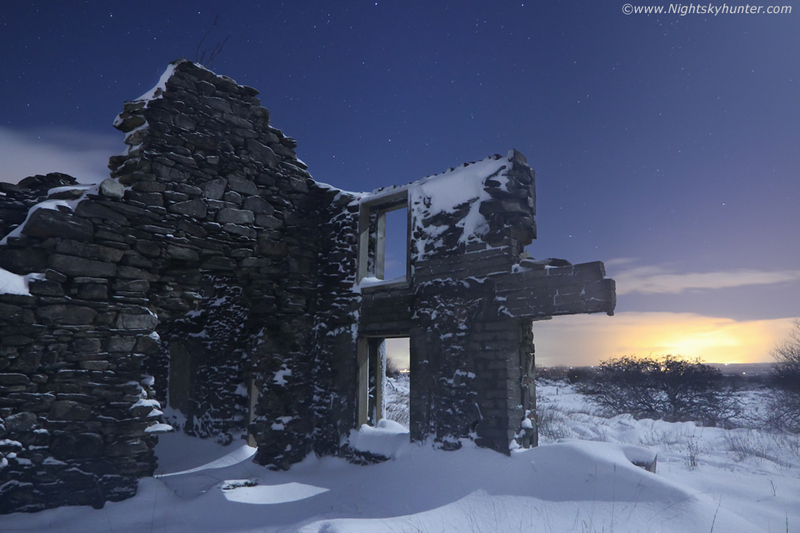 Good fortune would have it that the moon was high behind us so it illuminated the house and snow perfectly, any stars over this scene woud have been nice however fortune once again was on our side with Orion, Hyades and Pleiades all perfectly positioned over the ruins. It doesn't get any better than this, my tripod legs were buried in the snow so deep that only a small portion of the central column and camera could be seen above the snow. During exposures we had to keep still to avoid shaking the camera and that's when the deep penetrating cold began to set in, however the visual scene was so amazing we were easily distracted. There was no wind at all, everything was still and silent, the only sound was from a distant stream and by the occasional crunch of snow when we had to move or legs a little, other than this it was a pristine white world of beauty, Paul was shooting away and so was I, we were doing our own thing and lost in our own thoughts, nothing needed to be said, this was what we had came for. 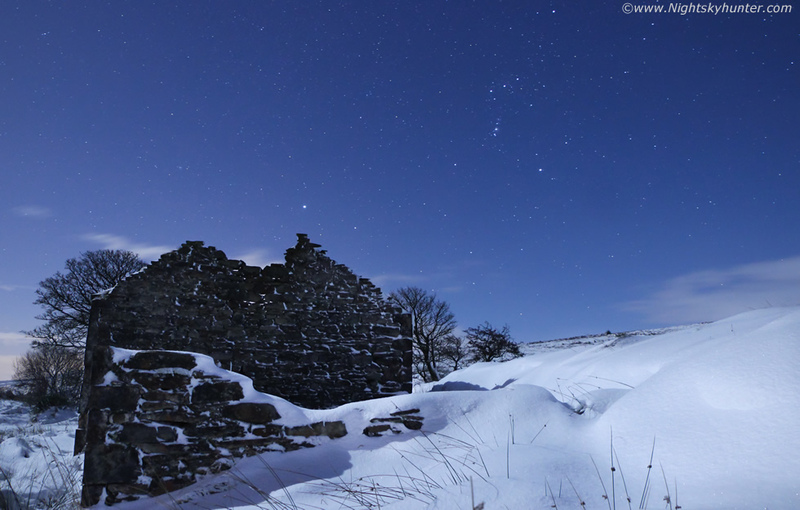 I was blown away by the texture on the stone walls and by the uneven spread of the snow in the Nly wind from earlier in the day, I was also impressed by the lens, never before have I captured such a sharp high contrast night image as this one, there's a lot to be said for Samyang lenses. This image here is my personal favourite winter scene of 2017 to date, it was exactly what I had visualized getting and Orion's belt and sword completed the scene. Drifting snow on N side of the house was fun to shoot in, camera was tilted and tripod legs at a crazy angle, very difficult to get level, I couldn't see through the LCD screen because of the steep gradient and kept sliding down the snow bank so I just took the image where it was and leveled the horizon in post. The Glenshane frozen tundra, not dissimilar to a B-roll scene from ice road truckers. That cloud was coming in fast, we had perhaps only 15 min's of shooting time remaining before our starry window was shut. 03.30 in the morning in sub zero temperatures and last exposure of the night just as the lens began to mist over. 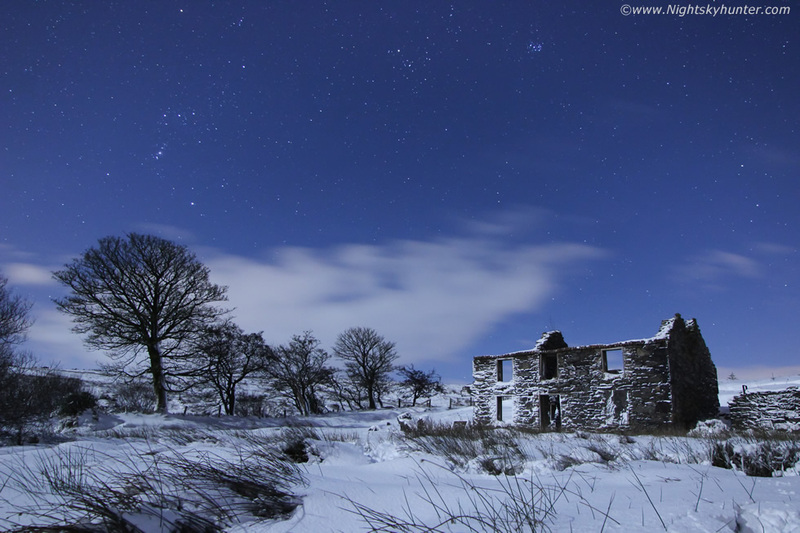 The ruins looked very cool in the moonlight, you can see the main hall entrance at centre, ruin engulfed by snow and ancient stars aloft, it's amazing to think that a family once lived in this house and celebrated Christmas inside, they may even have got excited to wake up at dawn to a fresh snow fall. By 03.30 cloud had arrived and we were frozen from standing inside such deep snow, even from 30 minutes of shooting, the cold was deeply penetrating and the shoot 'hangover' took days to shake, I would say it took me three days to warm up again. The following night temps dropped to -8C and the night after that -10C, we had snow on the hills for days and frosty nights for quite some time. Two days after this shoot we where driving to Coleraine for Christmas shopping and couldn't believe how beautiful the countryside looked, snow at low levels covering all the fields with sheep grazing, the hills and mountains were covered in what looked like nature's icing sugar with blue crisp skies, this view honestly reminded me of one such day back in 2010. These two cold spells produced exceptionally well with an abunbance of sky action and photogenic wonders which exceeded my expectations, below are a selection of drone and ground camera videos covering the highlights of both cold spells. Drone Flight 586. November 24th 2017, polar air and arrival of notable cold spell across N. Ireland. I wasn't expecting laying snow however I got a surprise morning phone call from drone pilot Nigel McFarland informed me that he could see snow on Glenshane Pass from Limavady. I couldn't believe it, I had a brew then left immediately with no breakfast and drove up the mountain into my first snow of the winter season. Gentle breeze at surface, stronger aloft, perhaps 10mph, outside temp 1C and wind chill -1 or lower. Luckily I had done a very cold IMU calibration the previous night in the frost so I had no warm up times at all, however I did keep the aircraft and batteries warm using the van heater which helped considerably. Good flight, no warnings, no tech issues, flew along the Glenshane Pass over the hills and countryside adjacent to the main road facing W then E, thrilling flight, always amazing to be able to fly over snow. Drone within VLOS, max range 511m, max height 88m. 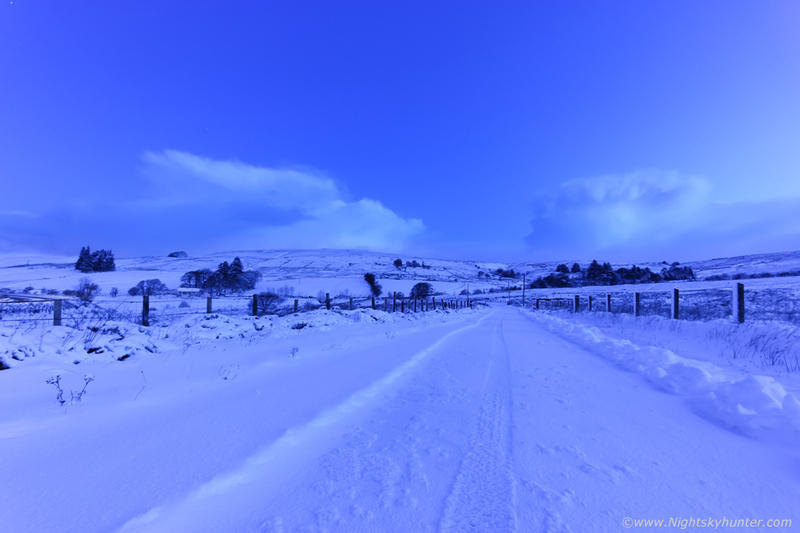 Day two of the recent cold spell, up at 07.00 and drove up Glenshane Pass to meet sunrise snow showers. Footage of the traffic and falling snow taken with my DSLR then a quick vlog at the end. Drone Flight 588. November 24th 2017, Polar air over N. Ireland produced the first snow of the season here. I got a drone flight in during the morning then by afternoon my Dad and I went back up Glenshane Pass for another aerial filming session when the light was more friendly. Very cold, temps 1 degree C, 7 knot wind, wind chill -1 degree C. We warmed batteries and drone in the van first then set up quickly and got in the air with no warm up times or batteries temp issues. However I lost RC signal several times and the app froze mid flight however I was able to get back in again reasonably quick. Flight went great, beautiful snow covered landscape, drone within VLOS, spotter used, max range 507m, max height 90m, landed with 42% battery. Drone Flight 589. November 25th 2017, day two of the late November cold spell when polar air overspread N. Ireland generating the first snowfall of the Winter season. I was up on the mountain at sunrise shooting stills and traffic driving though snow however it wasn't until late morning when the snow stopped and wind calmed down enough that I had a window to get the drone up. 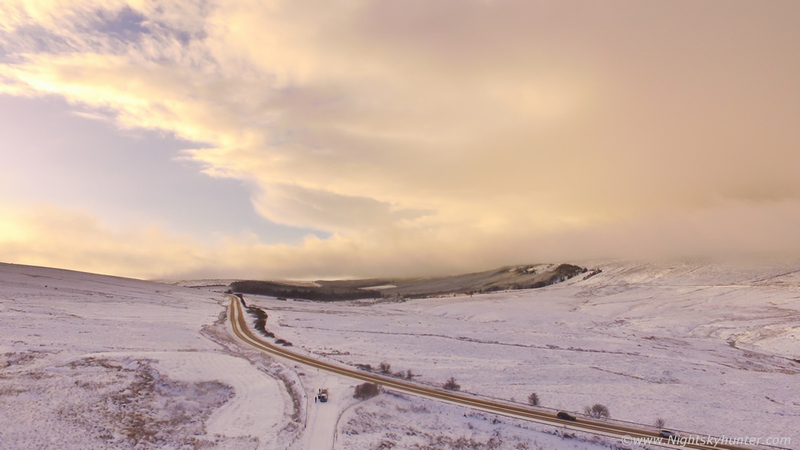 I took advantage of a 15 min dry gap and got the P3A in the air, this time over the snow covered western side of Glenshane Pass facing S then N, a very scenic area adjacent to the main road. Drone was warmed in the van sufficiently before the flight so there were no temp warnings with the aircraft or battery, however I did loose signal on the RC and the app froze for a moment, possibly due the tablet being out in the cold, other than this the flight went very well, simple straight flight over the winter landscape which was great fun. Drone within vlos, max range 527m, max height 64m, min height 8m. A short edit from snow chasing on Glenshane Pass Dec 8th and 9th 2017 during the second cold spell of the season. Filming on location since 06.30, traffic scenes, falling snow, snow blowing in wind, drone view (windy hence why props in view) and featuring a selection of moonlit snow images at 03.00 when the snow was up to knee level. A combination of DSLR video, Go Pro, mobile phone and drone footage, thanks very much for watching.